On this date, the House received a letter announcing South Carolina’s secession from the Union. 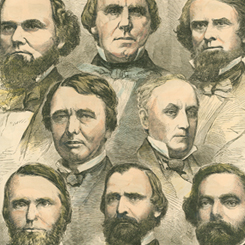 South Carolina Representatives John McQueen, Milledge Bonham, William Boyce, and John Ashmore authored the letter which declared that “the people of the State of South Carolina, in their sovereign capacity, have resumed the powers heretofore delegated by them to the Federal Government of the United States, and have thereby dissolved our connection with the House of Representatives.” Representative James Blaine of Maine would later recall that the “leave-taking [of the Southern Members], in the main, was not undignified. There was no defiance, no indulgence of bravado.” Blaine noted that while a “few Southern representatives marked their retirement by speeches bitterly reproaching the Federal Government, and bitterly accusing the Republican party . . . the large majority confined themselves to” retiring in a formal fashion. In addition to South Carolina, 10 more southern states seceded from the Union during the winter of 1860 and spring of 1861. Under the leadership of former U.S. Senator Jefferson Davis, the Confederate States of America formed in February 1861. The first shots the Civil War were fired on federal forces at Fort Sumter in April 1861.